This weekend was (allegedly) the end of Summer (although the weather and the calendar tell me otherwise). We celebrated with splashing, exploring and visiting some animals. So Tuesday the boys started “school”. As I mentioned Evan is attending three-day preschool while Noah is attending Mom’s Day Out program twice a week. Mark my words…there WILL be a day I forget that E has school since it’s out of our normal routine. E was required to have a “full size” backpack. I think I should have just cut leg holes in it since it’s as big as he is. I kind of loved this one from Pottery Barn Kids. Unfortunately they have some issues actually fulfilling their orders in a timely manner. 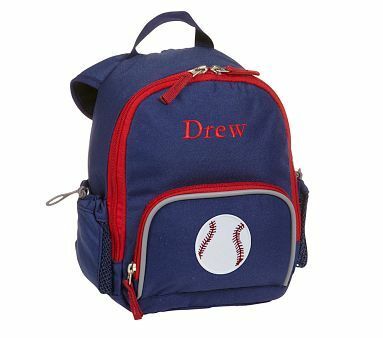 But it kind of worked out for the best, since I didn’t particularly want to spend $40 on a bookbag for a 3 year old…so I ended up customizing one for him. I found this bag and matching lunch box at Old Navy. I happened to have a few discount codes along with some rewards so I got the backpack for $4.26 (originally $15) and the lunch bag for $1.71 (seriously… I think that’s the cost of a single school lunch). Now these are not high quality and won’t last years but realistically AT MOST he’ll be carrying 3 sheets of paper and a box of crayons…so they were perfect for this project. I liked the colors but didn’t love the skull on the patch. I grabbed a few patches, some buttons and some felt from Hobby Lobby (I didn’t really have a plan…I just grabbed baseballs and red and white). Luckily the patches I bought just covered the skulls. The letter patches were too tall to include more than a few on the backpack so I decided to make a “Varsity Style” letter. I just printed the letter and outline on the matte side of some freezer paper then ironed it to my felt and cut it out. (REMINDER: Most craft felt is acrylic, so don’t turn the iron up too high or you’ll melt it…like I did…whoops). I finished my edges with a zigzag stitch but you could just use Liquid Stitch for a no-sew alternative. That’s how I attached everything to the bags. I just did a blanket stitch by hand to secure the edges. The baseball buttons I stuck thru the mesh on the sides and secured them with a few stitches. Can you please tell me the font you used for the big H. The varsity fonts out there don’t look as good as yours! Great project!